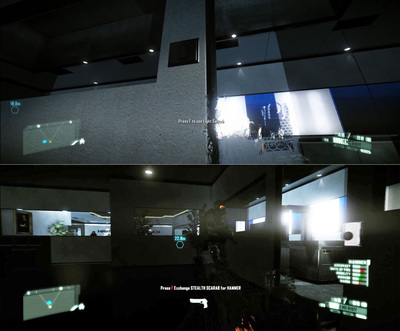 “Enemy of My Enemy” is a single player level for Crytek’s Crysis 2 that offers intense, cover based combat in office and laboratory settings and provides players the opportunity to unleash the Ceph to help combat their C.E.L.L. enemies. As the level begins, Alcatraz infiltrates Hargreave Rasch Biomedical with the intention of freeing the Ceph in order to prevent Hargreave Rasch from creating their own alien army through mind control experiments. Cornered, with few options, Alcatraz unleashes the alien prisoners on their captors, putting an end to Hargreave’s plans and leveraging the resulting chaos to cover his escape. Using lighting, movement, and framing to direct the player’s attention and guide them through the level. 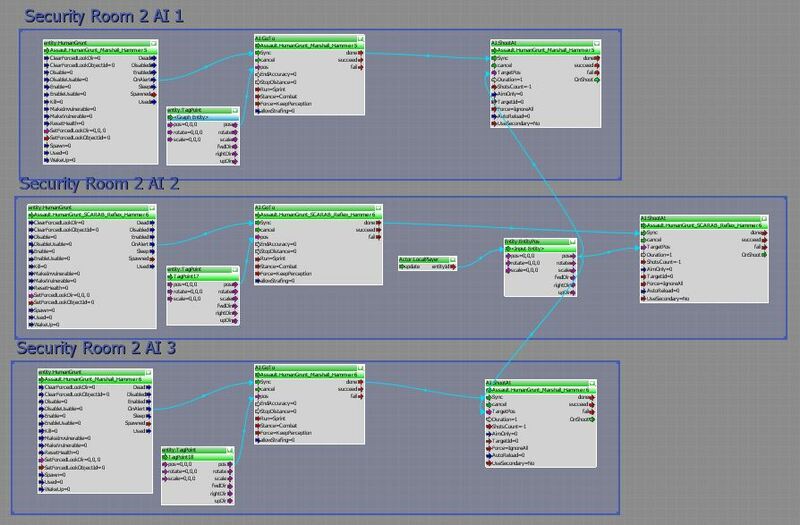 This level draws the player’s attention to objectives, scenes, and the player path by using different types of lighting including varying brightness, light flickering, and different coloration. 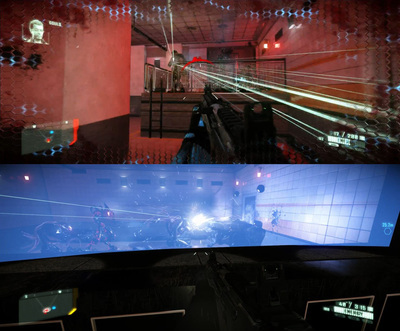 At various points, movement within the gameplay space directs the player’s attention to important areas of interest. 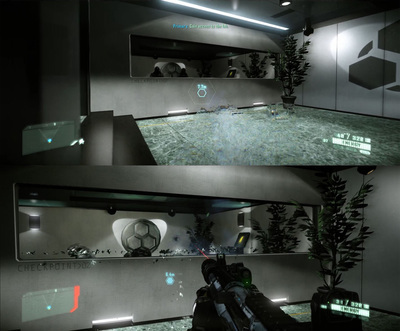 Environmental lines, doors, lights, and windows frame important scenes in the level to capture the player’s attention and make it more aesthetically pleasing. Empower the player by allowing them to use the Ceph as an unpredictable weapon against their human enemies. Throughout Crysis 2 the alien enemies, known as the Ceph, present the most difficult challenges in the game, “Enemy of my Enemy” empowers players by allowing them use this enemy, which they have grown to fear, as a weapon against their human adversaries. However, releasing the Ceph is a double-edged sword. 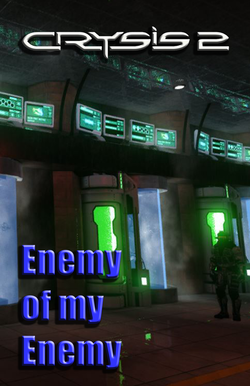 While it allows the player to utilize some strategy by standing back and letting the C.E.L.L. and Ceph fight it out, whittling down each other’s health, the unpredictable nature of the Ceph bring a tension to the gameplay because you never really know when they will turn on you. Create different type of enemy encounters in the same gameplay space by using it in altered ways. 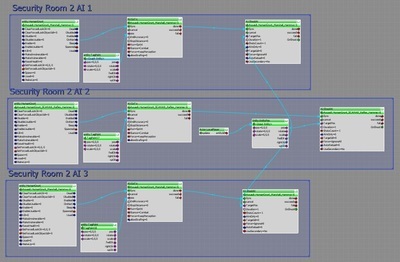 The player’s initial path through the security section of the level is slower paced and methodical. The slower pace of the combat gives players more time to assess their situation, the available cover, and implement more thoughtful tactics. The slower pace of the initial path through the security section ramps up to faster, more deadly combat once the Ceph freed. This means that players are required to change up their tactics and make faster, more adaptive decisions, which ensures that player has a very different play experience as they return through the same environments they played through before. After the players obtain the codes to free the Ceph, a pressure door opens and three C.E.L.L. soldiers rush in to confront the player. After I set up the A.I. got it to behave properly I decided I wanted a pressure door to open before the enemies entered to direct the player’s attention to their entrance and help direct the player to the right path. However, once I implemented the door, the enemies no longer rushed into the room. I discovered that despite building the A.I. beforehand, the enemies send out a pathing test as soon as they receive orders to move. The way the script was set up, the pathing test was going out while the door was closed and blocking their path, so the enemies just held their spawn positions. This problem was resolved by instituting a delay that would ensure they would not conduct the pathing test until the door was no longer an obstruction. Originally, as players entered the alien stasis chamber and the human soldiers rush in, they would spot the player and engage immediately despite the fact that the player was behind impenetrable nanoglass. The solution to this problem was to place a one-way mesh wall into the level. 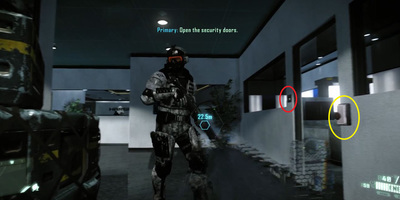 This meant the player could look through the invisible wall at the soldiers, but the soldiers would not see the player and would not engage. I then added dialogue for the soldiers to say after they rushed in, which kept the audible threats, and I also told the solder to aim their weapons, but not to shoot at the switch the player need to press to complete the objective. This maintained the illusion of them threatening the player, even though the C.E.L.L. could not see them. After player freed the Ceph, occasionally the four Ceph would die before killing the five humans in the room. This challenge was overcome by making two of the alien ambushers invulnerable. This allowed the human a chance to kill two of the aliens, so as to give the battle an appearance of believability while still ensure that the aliens will be the overall victors. Initially, when players exited the lab stairs into the security lobby on the return trip, the humans were on the side closest to the stairs. The aliens would rush forward and engage the player before they had a chance to acclimate to the war happening upstairs. This made for a very frustrating battle and created a lot of frustration. This challenge was solved by switching the positions of the humans and the aliens, so that the aliens are actually closest to the stair doors as players enter. 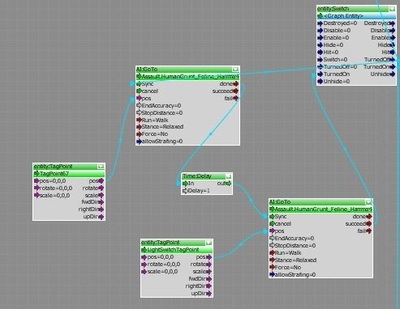 This ensures that the alien’s backs are to the players as they enter and if the aliens rush their attackers, they will rush the humans, moving away from the player’s position. This gives players an opportunity to get a better read on the environment and war before situations force them to enter the battle.